A public celebration of World Rivers Day and these accomplishments will take place on Saturday, September 24th 2016 at McKee Park located on the Detroit River shoreline at 3026 Sandwich Street, Windsor from 10am to 2pm. World Rivers Day is recognized in over 60 countries by millions of people each year to connect communities to their local river systems, raise awareness about issues and encourage responsibility and stewardship. “The DRCC invites the public to come out to the Detroit River to celebrate how far we have come, learn about this tremendous resource in our backyard and do your part to protect it,” Pannunzio adds. Guests will be able to participate in a local cleanup, learn about initiatives along the River, get some hands on experience with kayak demonstrations and meet likeminded people who care about the environment. Staff from the DRCC, the Windsor Port Authority, and Windsor Adventure Inc. will be there and registration runs from 9:30am to 10:00am at the DRCC tent. Due to intense urbanization and industrialization, the Detroit River’s ecosystem was degraded for plants, animals and humans to use. As a result, the river is designated as one of the 43 Great Lakes Areas of Concern (AOC) in the Great Lakes Water Quality Agreement (GLWQA). The DRCC implements the Remedial Action Plan (RAP) or cleanup program for the Canadian side of the Detroit River Area of Concern. Progress is recognized by measuring re-designation of beneficial use impairments (BUIs). Beneficial use impairments stop wildlife and humans’ ability to use the water system for survival in a healthy and safe way. The RAP outlines all of the steps that need to be taken to reverse the Beneficial Use Impairment to be not ‘impaired’ and then ‘delisted’ from the Area of Concern. Once all fourteen BUIs are addressed, the waterbody will no longer sit on the Area of Concern list, and be regarded as having water quality comparable to the Great Lakes System. For more information regarding the celebration or sign up to volunteer, please contact the DRCC at postmaster@detroitriver.ca. 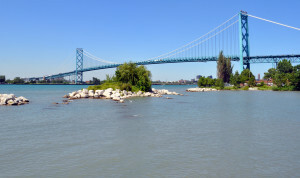 The Detroit River Canadian Cleanup (DRCC) is a community-based initiative launched in 1998 to cleanup, enhance, restore and sustain the Detroit River Ecosystem. Partnerships within the DRCC aim to promote and implement the cleanup plan called a Remedial Action Plan (RAP) to protect, enhance and restore the Detroit River in order to remove it from the list of Great Lakes Areas of Concern. The DRCC’s members provide leadership in identifying partnerships and funding opportunities to support and complete cleanup goals for the Detroit River. Windsor Adventure is your spot for outdoor adventure. Explore the trail and waterways with our programs, rental equipment and events. We offer the opportunity for individuals, groups, and families to experience memorable outdoor adventures. Operating out of Stop 26 Beach along Riverside Drive and Lake St Clair provides our clients with access to Peche Island, the Ganatchio Trail, the Little River Corridor and so much more. Let our experts help you enjoy the outdoors. Adventure on! In recognition of World Rivers Day, the Detroit River Canadian Cleanup is announcing that two indicators of the Detroit River’s quality are now considered restored, and no longer impaired. The frequency of beach closures is no different than sites outside of the Detroit River and the aesthetics of the River are void of substances, questionable deposits, turbidity and or odor. These two issues are no longer impaired due to the collaborative efforts of many partners to clean up the River. A public celebration of World Rivers Day and these accomplishments will take place on Saturday September 24th 2016 at McKee Park in Windsor, ON from 10am to 2pm. World Rivers Day is recognized in over 60 countries by millions of people each year to connect communities to their local river systems, raise awareness about issues and encourage responsibility and stewardship. Come out to the River to celebrate how far we have come, learn about this in our backyard and do your part to protect it! Guests will be able to participate in a local cleanup, learn about initiatives along the River, get some hands on experience with kayak demonstrations and meet like minded people who care about the environment! Staff from the DRCC, the Windsor Port Authority, and Windsor Adventure Inc. will be there and registration runs from 9:30am to 10:00am at the DRCC tent. Making Waves: Battle for the Great Lakes is a two-part documentary about aquatic invasive species in the Great Lakes and the efforts underway to control and prevent them. Narrated by Bill Kurtis, Making Waves takes viewers below the surface of the world’s largest freshwater ecosystem, and into the middle of a complex war for survival. The documentary follows researchers on the front lines as they combat invasive species and work to restore native species, in an effort to prevent a biological takeover of the Great Lakes.